If you need clutch repair in Tucson, and you’re looking for skilled car mechanics at an affordable price, we can help. We’re TCR II Suspension Brake & Alignment, southern Arizona’s leading auto repair shop. We provide top-quality car repair service and we specialize in clutches, disc brakes, wheel alignment, suspension lift kits and lowering kits. A clutch is a mechanical part lets you smoothly connect the power of your engine to a manual transmission, so its spinning action is transferred to the wheels. Depending on how and where you drive, the clutches for most manual transmission cars last anywhere from 4 to 7 years. Clutch assemblies contain several components – A clutch disc, flywheel and pressure plate. Over the years, various kinds of materials have been used for the friction facings of clutch discs. Today, the designs and materials used in clutches depend on the application, such as for ordinary “street” use or for racing. The flywheel is located in between the engine and transmission. It’s in the form of a disc with gear teeth, and it’s connected to the engine. The flywheel’s main purpose is to efficiently transfer power from your engine to the transmission. Also, the engine starter relies on the flywheel to turn over your engine when it’s started. Flywheels may need resurfacing from time to time, but unless they break unexpectedly not much else can happen to them. The pressure plate is located in the transmission bell housing and is connected to the transmission. It’s a round, metallic part which has levers, springs and fingers that are all controlled by the release fork connected to the clutch pedal. The amount of power your clutch can transmit depends on the amount of friction between your clutch plate and the flywheel, as well as the amount of force the spring places on your pressure plate. That’s why it’s so important that your pressure plate work properly. We also see several other kinds of clutch problems, such as “clutch chatter,” which is a shaking feeling when your clutch is engaged. This is usually caused by contamination of the clutch disc because of leaking oil or hydraulic fluid. We can sometimes solve this issue by resurfacing the flywheel. “Clutch drag” happens when the clutch disc doesn’t entirely release, even when the clutch pedal is fully depressed. This may be caused by a poorly-adjusted clutch, although usually it means that your clutch must be replaced. If you’re experiencing any kind of problem with your clutch, we can fix it. 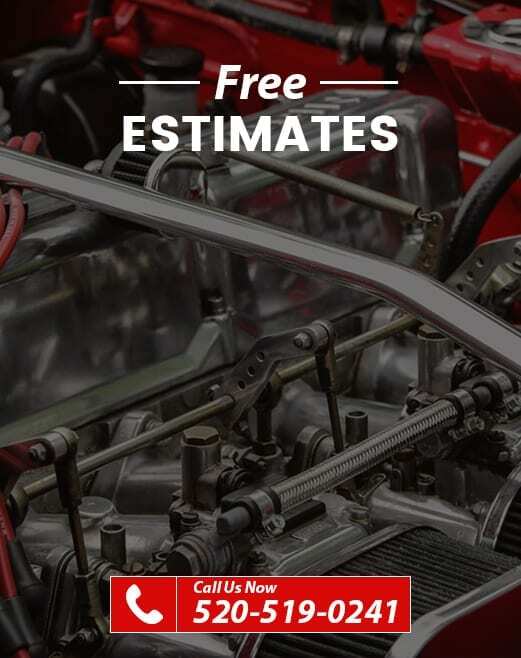 We’re Tucson’s auto repair experts, and we fully guarantee our work.